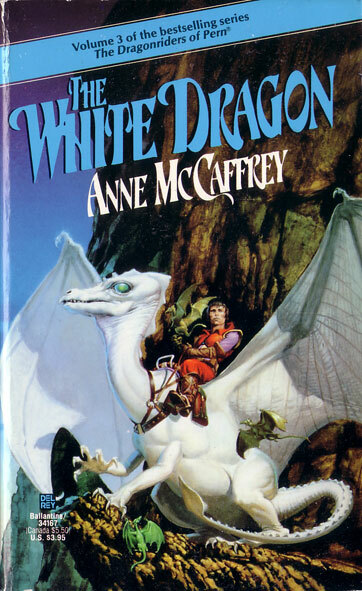 Fantasy author Anne McCaffrey has passed away this week at the age of 85. I will never forget her books or the magical world of Pern, where humans ride dragons, flitting back and forth between the dangers of reality and the stark emptiness of the nether. Anne's work was inspirational, unique, and unforgettable. I first experienced Pern in the third or fourth grade when a teacher handed me Dragonflight, the first book of the series Dragonriders of Pern. I went on to voraciously read everything else Anne had written. I can't deny there were many times I fantasized about writing my own books about people who ride dragons and communicate with them telepathically. The idea was just so cool, so unique. It spoke to me in the same way that the elves of Middle Earth did. In my mind, Pern almost became real. It was a place I wanted to visit, if not live. In time, I grew up and began building my own worlds. I didn't copy Anne, even if I might have liked to, but I still allow myself the luxury of returning to her world now and then. I guess it's time to pull those old books off the shelf. Rest in Peace Anne McCaffrey, and thank you for everything you've given us. Mike Hammer meets Grimm's Fairy Tales in Jamie Sedgwick's new mystery, Murder in the Boughs. Hank Mossberg is a hard-boiled San Francisco detective with his feet in two very different worlds. The first is the gritty concrete jungle, where Hank's unique skills allow him to track down the city's most notorious criminals, some of whom the police can't or won't even believe in. The second is the undercity, the hidden side of San Francisco where elven mobsters rule the underworld, nymphs walk darkened streets, imps are slave traders, and gnomes are elite hackers. The trouble begins when Hank stumbles onto a briefcase full of the illicit drug known as pixie dust. He finally has the evidence he needs to bring down the notorious Kaiser gang, but then the gang's leader is murdered and the pixie dust disappears. Hank is hot on the trail of the killer when he gets an urgent call from a desperate woman whose daughter has been kidnapped, only the kidnapper is no ordinary criminal, and even Hank's unique skills might not be enough to bring the girl home.